Ozzy Osbourne, Tony Iommi, Geezer Butler & Bill Ward form one of the most iconic groups to come from the UK in the last 50 years. Up there with Queen and The Beatles are Black Sabbath and they are releasing a long overdue album, 'Iron Man: The Best of Black Sabbath'. Their fame was somewhat overshadowed in recent years by Ozzy’s TV show ‘The Osbournes’ and his regular drug taking, not to mention the notorious incident from the band's early years when he bit the head off a bat! However, Ozzy's true legacy is his involvement with Black Sabbath. The quintet created some of the most haunting and hypnotic rock sounds of all time. The musical genre they created inspired countless musicians and spawned many other famous bands. They were inducted into the infamous Rock and Roll Hall of Fame in 2006 and were included among Rolling Stone's list of the 100 Greatest Artists of All Time. 'Iron Man: The Best of Black Sabbath' is a 14 track collection of classic tracks from across the bands’ first eight albums, including tracks from 1970's debut 'Black Sabbath' and follow up 'Paranoid', 1971's 'Master Of Reality', 1972's 'Volume 4', 1973's 'Sabbath Bloody Sabbath' and 1978's 'Never Say Die'. The release brings some of the best loved and most influential rock songs of all time together on one album, including such classics as 'Paranoid', 'Iron Man', 'Black Sabbath', 'Sabbath Bloody Sabbath', 'War Pigs' and 'Changes'. Ozzy Osbourne, Tony Iommi and Geezer Butler recently announced they are reuniting as Black Sabbath and recording a new album. They are scheduled to perform a headlining slot at the Download Festival on Sunday 10th June as well as a sold-out warm-up show at the 02 Academy in their home town of Birmingham on the 19th of May. 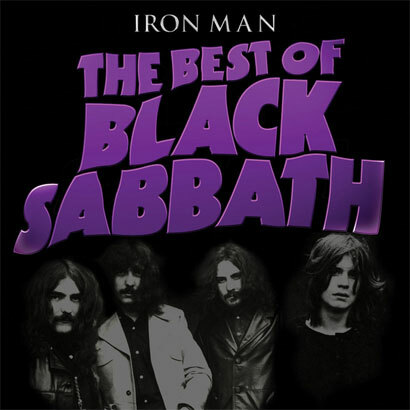 'Iron Man: The Best of Black Sabbath' will be released through Sanctuary on the 4th June 2012.